The ruby-throated hummingbird is the most common hummingbird in the United States and the only breeding hummingbird east of the Mississippi River. By learning how to properly identify ruby-throated hummingbirds, birders can identify different hummingbirds more quickly and easily by recognizing that they're aren't ruby-throats and knowing what key parts of a hummingbird to check for the subtle clues that separate species. Bill: Like all hummingbirds, the narrow, needle-like bill is ideal for sipping nectar from deep inside flowers. The bill is black and straight. 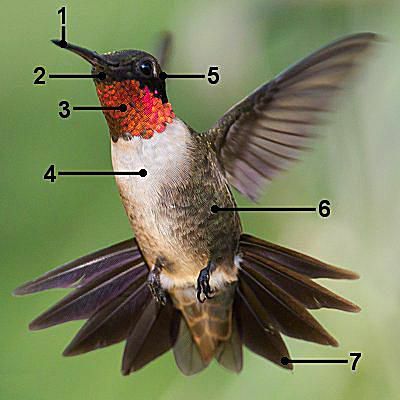 Chin: The chin of a hummingbird may be tiny, but it can be a clue to the bird's identity. The ruby-throated hummingbird has a black chin. Throat: The male ruby-throated hummingbird has a bright red throat, or gorget, with sparkling iridescence when seen in bright light. In shadows or poor light, however, the entire throat may seem dark or dull. Depending on the light, the throat may have an orange-red hue. Breast: The breast is bright white and unmarked. It makes a striking contrast to the bird's throat. Eye: The eye is dark, but there is a bright white spot just behind the eye. Because the head of the male ruby-throated hummingbird is dark, the spot can stand out significantly. Flanks: The bird's flanks are a gray-green color that may show some sparkling iridescence. The coloration doesn't quite fill in the underparts, however, and there may appear to be a pale line down the center of the abdomen. Tail: The ruby-throated hummingbird has a long, pointed tail with a deep notch at the center. Each feather is pointed, and on the male, each feather is dark. When the tail is held folded, the shape may be more difficult to see. Upperparts: (Not Pictured) The upperparts of the ruby-throated hummingbird are a bright green or green-gold with an iridescent sheen. The darker wings, when folded, contrast with the colorful body. Eye: Like the male ruby-throated hummingbird, a white spot is easily visible behind the female's dark eye. Cheeks: The auriculars of the female ruby-throated hummingbird are distinctly gray, though the amount of gray coloration can vary. This contrasts well with the pale throat and green head. Upperparts: Like the male, the upperparts of the female ruby-throated hummingbird are a shimmery iridescent green. Depending on the light, the feathers may show a yellow or gold hue. Bill: The bill of the female ruby-throated hummingbird is long, thin and uniformly black. 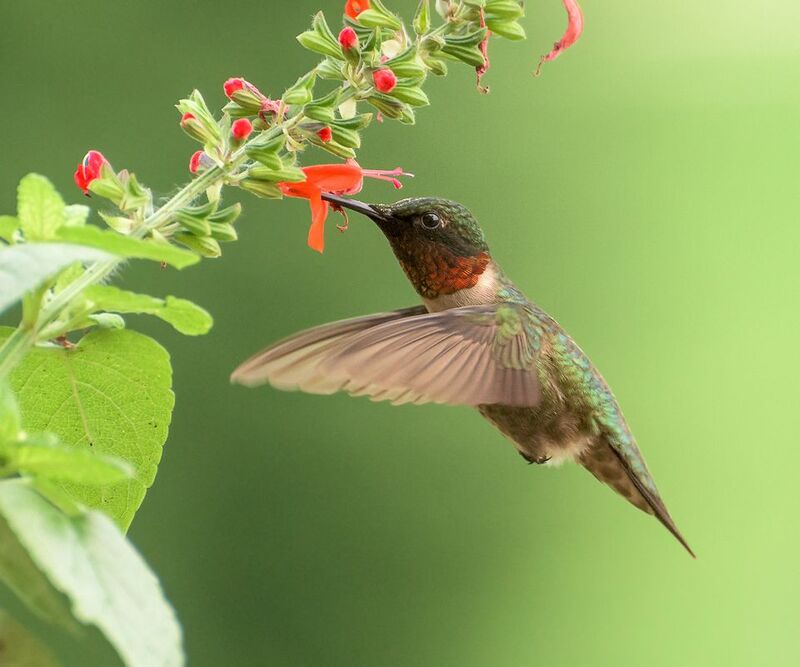 Throat: Unlike the male's colorful throat, the female ruby-throated hummingbird has a plain white chin and throat with only limited, faint gray streaking. The amount of streaking varies, but is generally minimal and may not be noticeable. Tail: The female ruby-throated hummingbird has a rounded tail without the sharp points of the male's tail feathers, though they are still somewhat pointed. The outer three tail feathers on each side have white tips, and when perched, the tail is slightly longer than the folded wingtips. Face: Juvenile male ruby-throated hummingbirds have the same gray auriculars that their mothers have, but the color is often less intense and less extensive. It will gradually darken to their mature plumage. Throat: While females have very faint gray streaks on the throat, juvenile male ruby-throated hummingbirds have much bolder streaks that will gradually show the red iridescence characteristic of their fathers. Young birds may show a few red spots near the base of the throat, and those spots will eventually become a full, colorful gorget. Flanks: The flanks of juvenile male ruby-throated hummingbirds are gray-green, but less richly colored than the flanks of adult birds. A touch of buff may be visible. Tail: Held folded, the tail does not show the pointed tips that are needed for identification, but the white spots inherited from the female parent are visible. In time, those spots will disappear with wear and the tail feathers will become fully dark as these male birds mature and molt. Upperparts: (Not Pictured) Like the adult birds, juvenile ruby-throated hummingbirds of both genders have bright green upperparts. The younger the birds are, the less iridescence the upperparts will show, but the color is still evident. Identifying ruby-throated hummingbirds can be a challenge in areas where this hummingbird's range overlaps with other hummers, but learning the careful clues that distinguish them is valuable for birders to feel more confident with every hummingbird they identify.